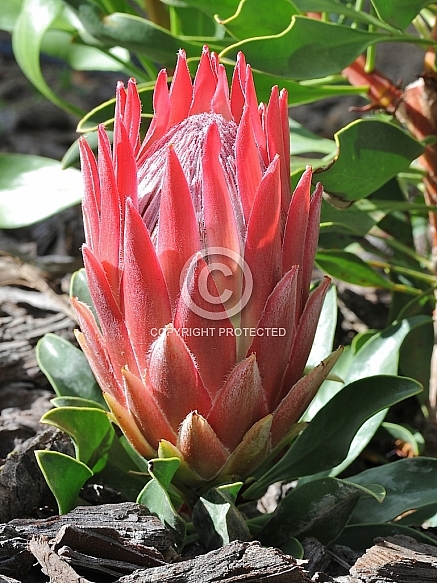 Description: The most spectacular and largest-flowered protea is also the national flower of South Africa and arguably the best-known member of the family. Some 80 naturally occurring variants of P. cynaroides have been described, and these are divided into groups mainly according to leaf type. The glabrous leaves vary from large and rounded to small and narrow, and the huge flowers can be very wide open, almost like dinner plates, or narrowly funnel-shaped. Colour can range from pure, greenish-white through soft, silvery pinks to deep red. Each of these variants has its own distinct flowering time. Additionally, several interesting dwarf variants are being marketed as ‘Mini Kings’ and are suitable for tub planting, smaller rockeries, confined spaces, etc. The selection illustrated is a very low-growing example which produces flowers at ground-level.